ESPN viewers had to depend on the crowd and player reaction on this game-winning field goal. The Arizona State Sun Devils are now 2-0 in the Herm Edwards era after upsetting No. 15 Michigan State 16-13 on Saturday night in Tempe, AZ. Michigan State led 13-3 entering the fourth quarter before the Sun Devils scored 13 unanswered points to come away with the victory. With three seconds left, the Sun Devils called timeout to set up sophomore kicker Brandon Ruiz for a 28-yard field attempt. So, with the timeout, ESPN had time to get a proper camera angle ready to go for the potential game-winning kick. ESPN went with a SkyCam angle, which started out fine, directly behind Ruiz. But the camera all of a sudden moved to the right of Ruiz and lost sight of the top of the uprights, leaving viewers with no idea if Ruiz made the kick. There was also a delayed reaction from ESPN play-by-play man Dave Pasch; he may have been depending on the TV angle as well. In the first few seconds after the kick, viewers only knew Ruiz made the game-winning kick by the roar of the ASU crowd and the players celebrating. ESPN just used a moving SkyCam camera angle that wasn't behind the kicker and cropped out any ability to see if the ball made it through the uprights. Wild move for the game-winning field goal attempt. It's 2018, it's time to stop pretending SkyCam is still cool for live football. Hey @espn – that might have been about the worst possible camera angle to capture a game winning kick ever. Couldn’t even see where the ball was going or if it went thru. C’mon man. What the hell was that camera angle on @espn for ASU's game winning FG? I had no idea, visually, if that went through the uprights. How do you screw up something that simple?? @espn are you kidding me. 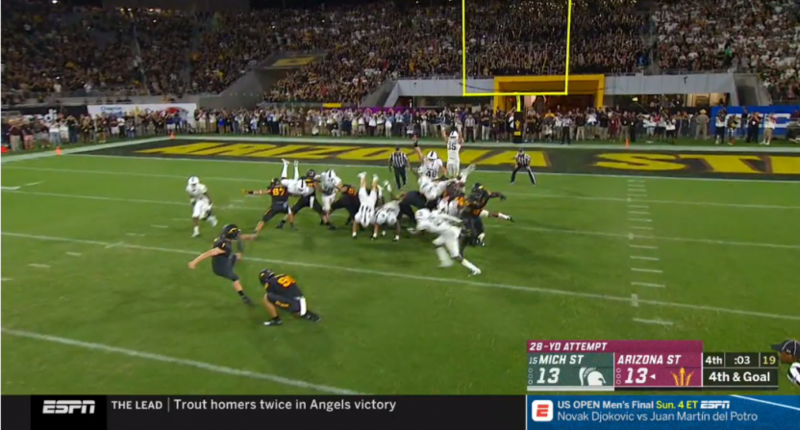 That might have been the worst camera angle ever for the game winning field goal in the Arizona State vs Michigan State game. How do you botch that up? Good lord ESPN botched that angle for the game-winning ASU field goal. You couldn’t even see it. Wow. Worst camera angle ever on game winning FG for Arizona St. Way to go ESPN. Couldn't even tell live. Lol! SkyCam and fancy camera angles can be useful (especially for replays), but sometimes simple is better (especially for live plays). Viewers would be just fine with a traditional camera angle behind the kicker or behind the uprights, just as long as they can actually, you know- see the game-deciding kick.